Since 1999, Promotional Spring has been a highly-valued marketing partner — keeping in step as our business has evolved and grown. Over the years, they have found new ways to meet the needs of our membership, provided creative POP solutions and even provided logistics solutions to marketing field tests; all the while delivering on frequently impossible deadlines. In the rare event of a misstep (even by us), they stood behind their work and made things right … no questions asked. They make my job easier by providing great ideas, attending to details and delivering (routinely over-delivering) on expectations—a relationship I’ve found consistently enjoyable. 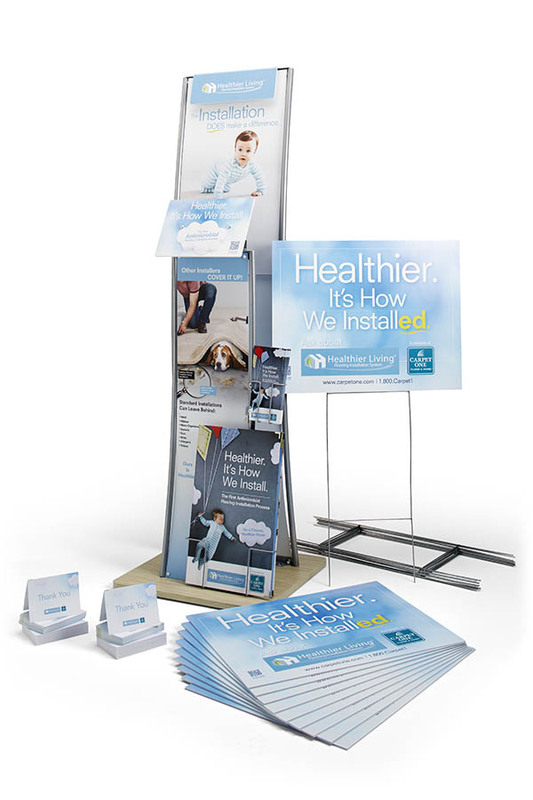 Working closely with Carpet One Floor and Home's Visual Merchandising and Marketing teams, Promotional Spring produced and distributed a host of POP and marketing materials for their exclusive Healthier Living® Installation Installation System. The kit was distributed to all of Carpet One's approximately 1000 North American locations. Promotional Spring took the list of deliverables provided by the Carpet One team and then made recommendations for fixture graphics, outdoor signage, in-store POP, and in-store collateral including brochures and thank you cards. Promotional Spring even custom engineered a Presenter to help Sales Consultants bring the product to life at the point of sale. Since 1999, Promotional Spring has managed marketing and collateral materials for approximately 1,000 locations in the U.S. and Canada. Promotional Spring utilizes an online marketing portal that makes it easy for both Carpet One's membership and marketing team to accomplish their goals. Products are customized and produced on demand or inventoried when it makes sense. The program enjoys high adoption and helps Carpet One ensure brand compliance.